Boutcher Primary School in Southwark worked closely with Imogen Piper, artist in residence, at Tower Bridge to create a new temporary exhibition inside the landmark. Pupils from the school took part in a series of engaging data-collection workshops, which saw them counting cars, bicycles, pigeons, selfie-sticks and many other things. A live data collection session, that took place on the Bridge, saw the children converting the numbers they had collected into a series of colourful image responses. The abstract work, which was produced with artist-in-residence Imogen Piper’s guidance, can now be seen on display as part of a temporary exhibition in the high-level Glass Walkways of the Tower Bridge, until mid-February. A visit to Tower Bridge can see students participating in workshops, suitable for Key Stages 1 – 4, which can be linked to a number of subjects including History, Geography and Science. Among the workshops are the Raise Tower Bridge, which is aimed at Key Stages 2 and 3, and focuses on the Bridge’s engineering and culminates in students working to raise the road of a miniature Tower Bridge. Other workshops include The Victorian Thames, which covers both History and Geography subjects, and Design the Skyline, which sees students challenged to design London’s future skyline as they take on the role of architects. In addition, the landmark can host Careers Days for Key Stages 4 and 5. These will see students exploring a range of jobs and careers available in the industry, as members of staff share information on their current role and career path. 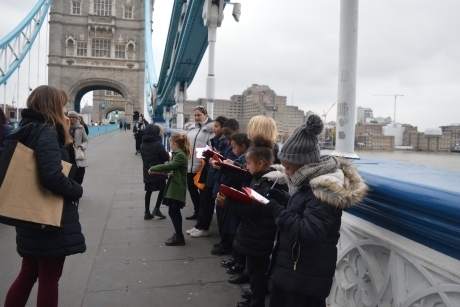 As part of the session, pupils will be involved in a hands-on marketing activity and will discover how Tower Bridge runs as both a working bridge and a tourist attraction. The Tower Bridge’s learning programme is aligned with the national curriculum for Key Stages 1-4. Sessions take place both inside the landmark itself, and in the dedicated learning facility, the Bridge Master’s Learning Centre. Pre and post visit resource packs are available, and goody bags can be purchased as an additional extra. Teachers can call 020 7940 8397 or email learning@towerbridge.org.uk for more information. For more information, visit www.towerbridge.org.uk/learning/schools/. An excited group of seven to 11-year-olds really pushed the boat out on their first trip to London that also involved the majority of them travelling by boat for the very first time.